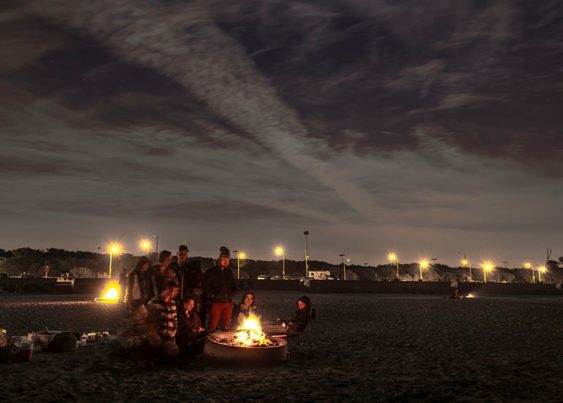 For the first time in four months, it’s finally legal again to have a bonfire at Ocean Beach. During the “No Burn” Season (which runs from November 1 to the end of February), bonfires are not allowed, but starting March 1, 2019 bonfires are back through the end of October with a few conditions. The National Park Service provides 16 fire rings/pits for Ocean Beach fires between Stairwells 15 and 20. The curfew each night is 9:30 pm. Read the rules below, bring your own firewood, avoid “spare the air” days, bundle up and have fun! Thanks to SF Station for the tip-off. Fires must be extinguished with WATER ONLY. Bring a bucket to collect ocean water, or bring your own water. Covering the fire with sand does not extinguish the fire. Instead it insulates the hot coals and fills the pits with sand. The parking lots at Ocean Beach close at 10 pm each night and are owned and managed by the City of San Francisco. Fires may be suspended by order of the park superintendent due to hot, dry weather conditions, strong winds, or extreme fire danger. Look for park alerts. No gathering, cutting, or scavenging of firewood or kindling is permitted in the park from any source. All firewood must be brought into the park. Burn Clean. Do not use accelerants such as lighter fluid, as they leave pollution and poisons in the air. Paper and kindling are preferred fire starter material. LEAVE NO TRACE. Trash must be removed from beaches, campsites, and picnic areas. Do not burn treated or painted wood. Do not burn pallets or any wood containing nails or other hardware. Do not burn trash or debris. Most trash gives off pollution and poisonous gases. Fires shall be attended at all times by a responsible adult (18 year of age or older). Minors must be supervised. A responsible leader, 18 years or older, must be present for every 10 children under the age of 18.